A confession: this very spicy chunky apple chutney is so yummy, I found it difficult to stop tasting it before I could pour it into the glass storage container. 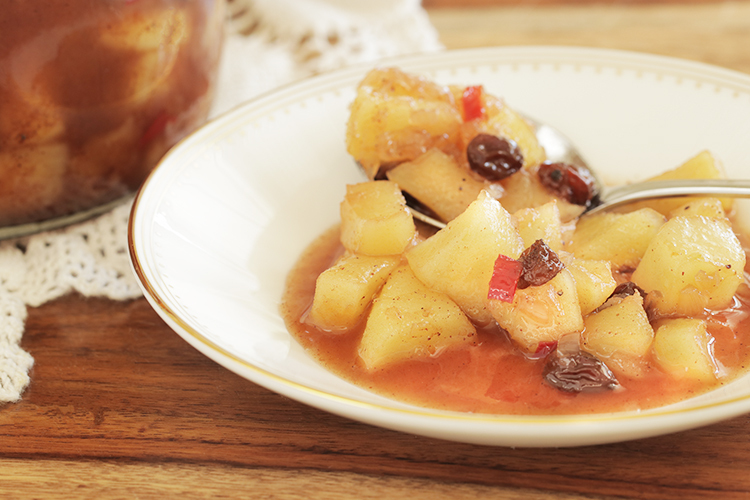 This apple chutney was created to serve with pork, such as a pork loin roast and pork chops. Flavors include a wonderful mix of spices typically included in an apple spice, fresh Gala apples, dried raisins, and ginger. The spicy heat comes from a red hot chili pepper. Preparation does take a little time but it’s worth the effort. 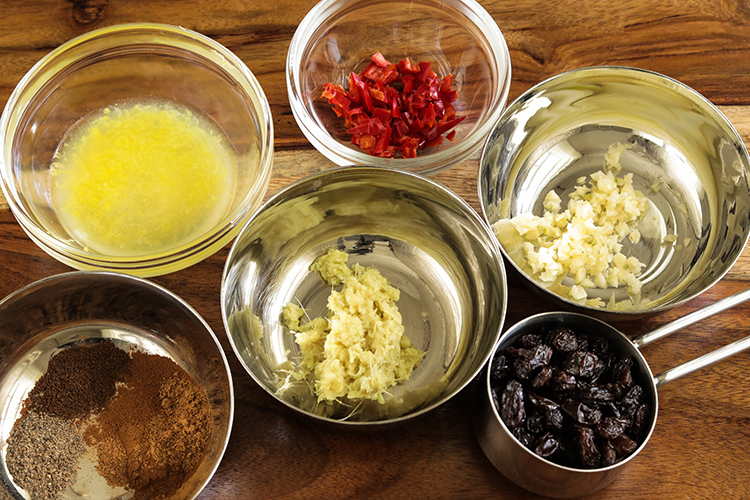 I like to assemble all ingredients right up front, such as shown here: lemon juice with lemon zest; red pepper, spices, ginger, garlic, and raisins. Tools: Use a heavy bottom preserving pan, a stainless steel or enamel lined pan and a pan cover. Copper, aluminum or a cast iron pan can react to the acidic vinegar and produce a metallic taste. Over medium high heat, melt butter in the pan. Stir in apples and cover. Saute apples for about 10 minutes until apples are slightly soft. Stir occasionally. Remove apples from the pan and set aside. Using this same pan, stir in the liquids (vinegar, wine and lemon juice and zest). Add remaining ingredients (red chili pepper, onions and ground spices). Bring to a boil, then lower temperature to a simmer and cover. Stir occasionally and continue to simmer for about 10 minutes. Add raisins and return apples to the chutney mix. Continue to simmer and stir for about 5-10 minutes.